Abbreviations of trails abound. But here are some other words and terms (in no particular order) commonly used by long-distance hikers. 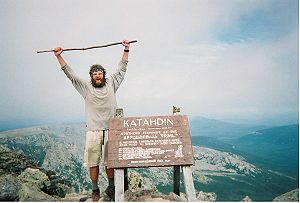 Thru-hiker: A hiker who will attempt to hike the complete trail in one go, or in one season. Section hiker: A hiker who hikes a trail in small sections; he or she may not plan on completing the trail. Trail Name: The catchy moniker a hiker chooses to go by for an extended hike. Examples are legion—Yogi, Vagabond, The Mad Viking, AWOL, Skittles, Dreamwalker, Hamlet (that’s me), etc. Choose a name before someone tags you with one you may not like. Camel up: Quench your thirst; fill your water bottles. Vitamin I: Ibuprofen, or similar pills to ease joint pain and treat other aches. TP: I saw this on everyone’s gear list and couldn’t figure it out. TP stands for Toilet Paper. Zero day: A no mileage day. Trail angel: Anyone, usually a non-hiker, who helps a hiker—ride, food, a place to stay, etc. Yogi: To not quite ask for food, but get it by looking hungry, forlorn—use your imagination. For a comprehensive list of trail terminology, see Michelle Ray’s How To Hike the A.T. This entry was tagged backpacking, camping, hiker jargon, hiking, long-distance hiking, thru-hiking, trail terminology. Bookmark the permalink. Hi, I don’t understand your comment. TP for hikers means toilet paper. Happy trails. When you run out of toilet paper on a long thru-hike (one without McDonalds, Starbucks, or a mall) the stuff becomes more valuable than money. There are stories about people trading TP for food. Maybe this isn’t the case east of the Rockies, but out here “mountain money” is jargon for toilet paper. Aha! Now I understand. Thanks for clearing this up for me. Great post…I am a big fan of vitamin I on my hikes! It’s the miracle vitamin. Yes, vitamin I is the miracle vitamin. Happy trails! Reblogged this on Tinkerbell's adventures.